Welcome to the rolling landscape around Lake Siljan in the middle of Dalarna! A landscape formed by a meteorite impact 366 million years ago! Here you’ll find an intriguing mix of traditional and modern in the form of music, festivals, Midsummer celebrations, working summer dairy farms and much, much more. The area has a fantastic nature with great opportunities for those seeking outdoor experiences: paddling, biking, hiking, riding, swimming, fishing and in the winter: cross-country and downhill skiing, skating, ice fishing, snowshoeing. The newspapers are in Swedish. Close to Siljan means close to everything: all of the villages lie within a short distance of each other so it´s never far to the next activity. Here we present a small variety of what there is to see and do in the area. 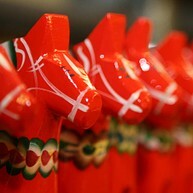 We already know that a visit to the Siljan district is something extraordinary. Now it´s your turn to discover it for yourself. 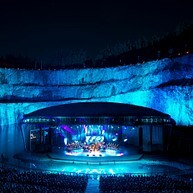 In Dalhalla, Sweden has established a unique festival stage of international repute with exceptional acoustical qualities, fully comparable to the best outdoor venues in Europe. Even described as one of the most powerful and beautiful outdoor venues in the world. Today Dalhalla present 20-25 events each summer, from June to september. The program includes a wide range of concerts in many different musical styles. 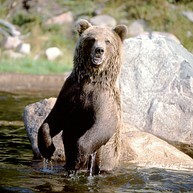 Opera performances will highlight Dalhalla best sides. Dalhalla´s renowned acoustics will also come into their own when usually no amplification is used, which would be unique to an outdoor venue. Opera is Dalhalla hallmark. Anders Zorn, is probably Sweden’s most famous artist and lived and worked in Dalarna in the late 1800s and early 1900s. 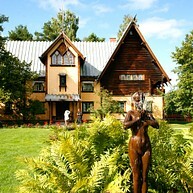 Visit the Zorn House and next-door Zorn Museum in the centre of Mora for an insight into his fantastic art and equally fantastic life. The extensive collections of the house mix art and crafts from different parts of the world with kurbits (Dalarna paintings with rich floral surrounds) and Dalarna traditions. There are fine woven wallpapers, antique marble sculptures, old master paintings and furniture designed by Zorn himself. The museum puts on a number of high-quality exhibitions each year. The real Father Christmas lives in a house the deep forest at the foot of Gesundaberg hill, near the town of Mora in the heart of Dalarna. Witchcraft and magic are the themes here, with elves and fairies, pixies, witches and trolls – and of course the winter queen. Santa, of course, is happy to receive Christmas lists all year round... and his loud, infectious laughter can be heard the length and breadth of Santaland. So make a wish and let yourself be swept along by this story-filled adventure. The nature of Siljan is perfect for cyclists. Here you find winding gravel roads for families, tricky terrain courses and breathtaking "downhill " for the brave ones and road riders will find miles and miles of black asphalt. In the summertime there are several bicycle races for both amateurs and professionals. Challenge yourself and your friends and experience the natural beauty, culture and tradition from the saddle. In the surroundings of Lake Siljan and Orsa Lake there are three classical routes that are well worth trying: Siljansleden (about 300 km), Vasaloppet Trail (90 km) and Dalkarlsvägen, hiking route following the historic migrations that the people of Dalarna went to work in Stockholm. There are also a number of shorter trails with emphasis on the particular natural values in the area. Leads that are also geologically interesting places, live mountain pastures, untouched wilderness, cultural environments, bird lakes and lookouts with beautiful views of Lake Siljan. 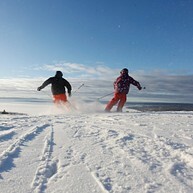 For those who appreciate a ride on the length there are many miles of well-prepaired ski trails in the lake Siljan Area, often in direct connection to the ski facilities. If you wish to develop your skiing technique, there are a number of training courses organized here. At the Tourist Center you can get more information about the ski trails and buy local trail maps. 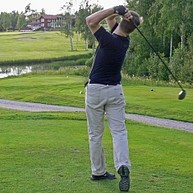 Play golf around Lake Siljan! The short distance between the six golf courses enables you to have time to play at several of the courses during your stay in the area. Tällbergsbyarnas GK in Plintsberg is located on the slope down towards Lake Siljan. Leksands GK lies close to the bird-rich area Limsjön. You will find Dalarna 's oldest golf course, in Rättvik. Furudals GK has a park and forest course. Sollerö GK is a challenging and at times difficult forest and park course. Mora Golf Club is a beautiful centrally located forest course next to the river Dalälven. Five family-friendly ski resorts with everything from children's slopes and ski schools to button lifts and snow parks: Orsa Grönklitt, Gesundaberget, Gopshus Slalom, Rättviksbacken and Granberget Leksand. With just a few miles apart you can have a varied and comfortable skiing holiday with access to different ski slopes from day to day. 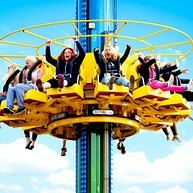 Leksand Sommarland, on the shore of lake Siljan, ticks all the boxes for excitement, thrills and spills and high velocity fun. There are high-speed, adrenaline-buzzing attractions like the Crazy Canyon, the longest artificial white-water rafting course on the planet. Or the kids might opt for Free Fall, an attraction with a drop of 17 metres. And maybe even Speed Hill, a frighteningly steep, 100-metre long water slide for mini daredevils. If you want to take a break from the action the park has picnic spots and has several restaurants of the tacos, pizza, burger and fish ‘n chips variety, as well as a food court. The other aquatic and non-aquatic attractions for speedsters include; go-carts, quad bikes, white-water rafting and a BMX course. If that wasn’t enough there is a new 20 metre high, 310 metre long Zip line that will whizz you over Leksand Sommarland at a speed of 50+ km per hour. Chalet and camping accommodation is available at Leksand Strand Camping & Resort.